• Israeli forces continued to use excessive force against unarmed civilians and peaceful protestors in the Gaza Strip and West Bank. – 311 civilians, including 59 children, 120 women, 4 journalists and 4 paramedics, were wounded. – Eight of those wounded sustained serious wounds. – 3 civilians were wounded in the West Bank. • Israeli forces conducted 56 incursions into Palestinian communities in the West Bank, and 9 limited incursions into occupied Jerusalem. – 42 civilians, including 4 children and a woman, were arrested in the West Bank. – 15 of them, including 2 children, were arrested in Jerusalem. • Israeli authorities continued to create a Jewish majority in occupied East Jerusalem.  Residents of al-Khan al-Ahmar were notified to evacuate their dwellings and self-demolish them.  A guard and 2 officers in the al-Aqsa Mosque Reconstruction Committee were denied access to al-Aqsa Mosque. • Israeli forces continued their settlement activities in the West Bank.  A civilian was notified to stop the construction works in his house and 2 other houses were photographed in al-Walajah village.  An under-construction house was demolished in Rantis village, west of Ramallah.  Israeli forces levelled lands in Khelet al-Nahklah Hill opposite to Urtas village. • Shooting was reported against the Palestinian fishing boats in the Gaza Sea, but no casualties were reported. • Israeli forces turned the West Bank into cantons and continued to impose the illegal closure on the Gaza Strip for the 11th consecutive year.  Dozens of temporary checkpoints were established in the West Bank and others were re-established to obstruct the movement of Palestinian civilians.  One civilian was arrested at the military checkpoints in the West Bank.  Beit Hanoun “Erez” Crossing was closed in the northern Gaza Strip. Israeli violations of international law and international humanitarian law in the oPt continued during the reporting period (20 – 26 September 2018). • At approximately 02:00, Israeli forces moved into Beit Rema village, northwest of Ramallah. They raided and searched a house belonging to Rami ‘Ezat el-Remawi (25) and then arrested him. Note: During the aforementioned day, Israeli forces conducted (5) incursions in the following areas and no arrests were reported: Taqou’a village, east of Bethlehem; Qalqiliyah, and ‘Azzoun village, east of Qalqiliyah; and Salfit. • At approximately 01:50, Israeli forces accompanied with a number of military vehicles moved into Kufor al-Deek village, west of Salfit and patrolled the streets. They raided and searched a house belonging to Ahmed Nabih Othman Naji (24) and then arrested him. • At approximately 02:00, Israeli forces moved into al-Duheishah refugee camp, south of Bethlehem. They raided and searched a number of houses and maltreated the residents. Among those houses raided houses belonging to Ibrahim Mezher, Rawhi Mezher and Mahmoud Manasrah. The Israeli forces also raided and searched a house belonging to Ra’ed al-Salhi, who was shot dead by the Israeli forces in September 2017. The soldiers searched for the house of Arkan Mezher’s family, who was killed by the Israeli forces when they moved into the camp as the Mezher’s family had temporarily moved out to another house in order to repair their house. During the incursions, clashes erupted between the young men and the Israeli soldiers, who heavily fired rubber bullets and tear gas canisters at young men. As a result, many civilians fainted and felt nausea due to gas inhalation, including a 3-year-old child, whom the ambulance crews did not manage to approach him, so he received medical treatment on the spot. The Israeli forces phone called Tha’er Helmi Mezher (45) to refer to the Israeli Intelligence Services in “Gush Etzion” settlement complex, south of the city. Tha’er’s family said to PCHR’s fieldworker that the Israeli forces headed by the Israeli officer Nidal raided and searched the family’s old house in al-Duheishah refugee camp. When the soldiers did not find Tha’er, officer Nidal phone called him and summoned him to immediately refer to the Israeli Intelligence Service. The family added that Tha’er went to the settlement and met with the Israeli officer, who ordered him to come back next Sunday. After half an hour, officer Nidal phone called Tha’er and his brother Abdul Hakim and ordered them to immediately refer to the Israeli Intelligence Service. Tha’er was arrested after he referred to the Intelligence Service. It should be noted that the Mezher is the father of Arkan, who was killed by the Israeli forces when they moved into al-Duheishah refugee camp on 23 July 2018. • At approximately 03:55, an Israeli force accompanied with several military vehicles moved into Tulkarm and patrolled the city streets. They raided and searched a house belonging to Ahmed Ayman Khalil (23) and then arrested him. • At approximately 07:50, Israeli gunboats stationed offshore, adjacent to al-Sudaniyah area, west of Jabalia in the northern Gaza Strip, heavily opened fire and chased Palestinian fishing boats sailing within 4 nautical miles. As a result, the fishermen were forced to flee fearing for their lives, but no casualties were reported. • At approximately 11:00, Israeli soldiers patrolled in the Old City and the vicinity of the Ibrahimi Mosque in Hebron, arrested Islam Rateb Zahedah (28), a worker at Ibrahim Poor House Society, which provides free food near the Ibrhimi Mosque, when he was near the Gate (7) leading to the Ibrahimi Mosque. • At approximately 21:05, an Israeli drone fired a missile at a group of Palestinian civilians, who were in the vicinity of the Return encampment, east of Abu Safiyah Hill, northeast of Jabalia in the northern Gaza Strip. As a result, a 25-year-old civilian was hit with a shrapnel to the back and bruises throughout his body. The Israeli forces announced that the Israeli warplanes targeted a group of civilians in the northern Gaza Strip. Note: During the aforementioned day, Israeli forces conducted (4) incursions in the following areas and no arrests were reported: al-Samou’a, Beit Awla, Barqin villages and Ras Nemrah neighborhood in Hebron. • At approximately 01:45, Israeli forces moved into Nablus. They raided and searched a number of houses and then arrested 3 civilians namely Mohammed Rasmi ‘Oukal (27), ‘Anan Ibrahim Faraj (23) and Samer Khaild Abdul Karim Jabri (21). • At approximately 02:15, Israeli forces accompanied with a number of military vehicles moved into ‘Azzoun village, east of Qalqiliyah and patrolled the streets. They raided and searched houses belonging to Qassam Sofian Mustafa Rayashi (21), Hamzah Saleem Darrar Redwan (22), Ra’ed Saleem Darrar Redwan (20) amidst firing sound bombs and tear gas canisters and then arrested them. • At approximately 02:30, an Israeli force accompanied with several military vehicles moved Dura, southwest of Hebron and stationed in Wad Abu al-Qomrah neighborhood, east of the City and patrolled between houses. They raided and searched a house belonging to Oweis Hashem al-Rajoub (26) and then arrested him. • Around the same time, Israeli forces moved into Barqin village, west of Jenin. They raided and searched a number of houses after which they arrested Tareq Ibrahim Abu Shadouf (27) and Ahmed Sami Ghunaim (28). • At approximately 02:35, Israeli forces accompanied with several military vehicles moved into al-Jalazoun refugee camp, north of Ramallah. They raided and searched a house belonging to Ahmed Abu Sabri (16) and then arrested him. • Around the same time, an Israeli force accompanied with several military vehicles moved into Jaffna village, north of Ramallah and patrolled between houses. They raided and searched a house belonging to Qutiaba Jalal al-Bayari (17) and then arrested him. • At approximately 00:55, Israeli gunboats stationed offshore, adjacent to al-Sudaniyah area, west of Jabalia in the northern Gaza Strip, heavily opened fire and chased Palestinian fishing boats sailing within 4 nautical miles. As a result, the fishermen were forced to flee fearing for their lives, but no casualties were reported. Note: During the aforementioned day, Israeli forces conducted (6) incursions in the following areas and no arrests were reported: Hebron, Deir Samet, Surif and Kharsa villages in Hebron; Hares village, north of Salfit, joyous village, northeast of Qalqiliyah. • At approximately 02:15, Israeli forces moved into ‘Asker refugee camp, northeast of Nablus. They raided and searched a number of houses after which they arrested Ibrahim ‘Awni Ibrahim al-Naqib (22) and Ashraf Mohammed Mot’ab Fa’our (20). Note: During the aforementioned day, Israeli forces conducted (10) incursions in the following areas and no arrests were reported: Beit Ummer, al-Shuyoukh, Deir Zareh and Abu al-‘Erqan villages in Hebron; ‘Ezbat Shufah, Far’oun, Kufor al-Lubed, ‘Anabta and Rommanh villages in Tulkarm; and Qalqiliyah. • At approximately 01:35, Israeli gunboats stationed offshore, adjacent to al-Waha former Resort, northwest of Beit Lahia in the northern Gaza Strip, heavily opened fire and chased Palestinian fishing boats sailing within 3 nautical miles. The shooting continued until approximately 14:00 on the same day. As a result, the fishermen were forced to flee fearing for their lives, but no casualties were reported. • At approximately 16:00, Israeli authorities closed al-Zawiyah Gate and Beir al-Sabe’a Street in the center of Hebron to secure the Israeli settlers’ entry through al-Shuhada’a closed Street into the Tomb of “Othniel” to perform Talmudic prayers. The soldiers patrolled the area, forced the shops’ owners to close and banned the residents of the neighborhood to approach their houses in presence of journalists and volunteers from B’Tselem. the Israeli soldiers attacked Manal No’man al-Ja’bari (39), who works at B’Tselem, and attempted to push her and ban her from taking photos. The soldiers also threatened her to leave the area or she will be arrested. After Manal left the area, members of the Border Guards chased and arrested her without a reason as a police officer attempted to take Manal’s camera claiming that she attacked him. Manal was taken to al-Shuhada’a Street and then transferred to the interrogation center in “Kiryat Arba” settlement where she was released after investigation with her. • At approximately 01:30, an Israeli force accompanied with several military vehicles moved into the southern neighborhood in Tulkarm (‘Ezbet Nasser) and patrolled the streets. They raided and searched houses belonging to Mustafa Omer Mustafa Bdair (33) and then arrested him. • At approximately 01:30, an Israeli force accompanied with several military vehicles moved into Surif village, west of Hebron and stationed in the western neighborhood of the village. They raided and searched a house belonging to Isra’a Khader Lafi (35). They locked the family members in one room and then arrested Israa’ and took her to where the military vehicles stationed. Meanwhile, another Israeli force raided and searched a house belonging to Mohammed Samih Ghuneimat (25) and then arrested him. At approximately 03:00, the Israeli forces withdrew from the village taking the arrestees to an unknown destination. PCHR’s fieldworker was informed that Israa’ was transferred to Hasharon Prison after she was brought before the military court on the same day. The detention period of Israa’, who is a journalist writer, was extended to 8 days. • At approximately 02:30, an Israeli force accompanied with several military vehicles moved into Qalqiliyah and patrolled the streets. They raided and searched houses belonging to Ismail Ahmed Jebril (20) and Mohammed Nabil al-‘Adel (21) and then arrested them. • Around the same time, an Israeli forces accompanied with several military vehicles moved into Thanabah Suburb in Tulkarm and patrolled the streets. They raided and searched a house belonging to Rami Zaki Badwan (36) and then arrested him. • At approximately 02:45, an Israeli force accompanied with several military vehicles moved into Joyous village, northeast of Qalqiliyah and patrolled the streets. They raided and searched a house belonging to Ehab Hamad Saleh (21) and then arrested him. • At approximately 03:00, an Israeli force accompanied with 3 military vehicles moved into Thanabah village, west of Hebron and stationed in Wad ‘Aziz neighborhood. They raided and searched a house belonging to Feras Mohammed Ibrahim ‘Awad (22) and then arrested him. • At approximately 14:00, Israeli soldiers deployed in Hebron’s Old City arrested Mustafa Mohammed al-Qawasmah (14) claiming that he threw stones at the soldiers. The soldiers took him to the detention center in “Kiryat Arba” settlement, east of Hebron. Hebron’s Old City witnessed an intensive deployment of the Israeli forces to secure the entry of Israeli settlers, who were coming to the city for celebrating the Jewish holidays. Note: During the aforementioned day, Israeli forces conducted (4) incursions in the following areas and no arrests were reported: Yatta, Deir Samet, Beit Awla and Kharsa villages in Hebron. al-Shawkah village, east of Rafah. • At approximately 16:30 on Friday, 21 September 2018, thousands of civilians, including women, children and entire families, started swarming to the 5 encampments established by the Supreme National Authority for the Great March of Return and Breaking Siege along the border fence, east of the Gaza Strip governorates. They raised flags and chanted national songs. Hundreds, including children and women, approached the border fence with Israel, set fire to tires and gathered 300 meters away from the main border fence. Some of them attempted to throw stones at the Israeli forces; pulled parts of the barbed-wire fence established inside the Palestinian territories and fired incendiary balloons along the border fence. In limited cases, a number of the protestors approached the border fence and attempted to cross it in the eastern Rafah and Gaza City. • The Northern Gaza Strip: 38 civilians, including 15 children, were wounded. Twenty nine of them were hit with live bullets and their shrapnel and 9 were hit with tear gas canisters during their participation in the demonstration that was organized in the east of Abu Safiyah Hill, north east if Jabalia. Doctors classified 2 civilian’s injuries as serious. • Gaza City: Karim Mohammed Mahmoud Kollab (20), from Gaza City, was hit with a live bullet that penetrated the abdomen and exited the back during his participation in the demonstrations organized in the east of al-Shuja’iyah neighborhood in Gaza City. Moreover, 112 civilians were wounded. Sixty five of them, including 6 children, were hit with live bullets while 47 civilians were hit with tear gas canisters. Among those wounded was Abdul Rahim Yusuf Abu Baid (29), a paramedic at the Palestinian Civil Defense, was hit with a live bullet to the left leg. • Khan Younis: 19 civilians, including 4 children, were wounded in the east of Khuza’ah village, east of Khan Younis. Twelve of them were hit with live bullets and their shrapnel and 7 were hit with tear gas canisters. Doctors classified a civilian’s injury as serious. • The Central Gaza Strip: 5 civilians, including 4 children, were wounded in the east of al-Buraij. Fourteen of them were hit with live bullets and their shrapnel and one civilian was hit with a tear gas canister. • On Saturday, 22 September 2018, 11 civilians were hit with live bullets and their shrapnel, including journalist Anas Jamal Mahmoud al-Sharif (21) from Jabalia, who was hit with live bullet shrapnel to the abdomen, in a demonstration that was organized in the east of Abu Safiyah Hill, northeast of Jabalia in the northern Gaza Strip. • Around the same day, 2 civilians, including a freelance journalist, were hit with live bullets and their shrapnel, east of Khuza’ah village, east of Khan Younis in the southern Gaza Strip. 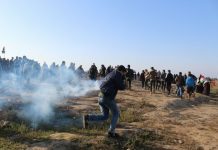 • At approximately 21:00 on Sunday, 23 September 2018, a civilian was killed while 15 others were wounded by the Israeli forces stationed along the border fence, east of Malakah intersection, east of al-Zaytoun neighborhood in Gaza City, during their participation in the March of Return and Breaking Siege activities. The Israeli forces fired live and rubber bullets and tear gas canisters at them. As a result, ‘Emad Dawoud Mahmoud Eshtiwi (21) from al-Zaytoun neighborhood after being hit with a live bullet to the head. Moreover, 15 civilians were wounded. Ten of them were hit with live bullets and 5 others were hit with tear gas canisters. Among those wounded were Ahmed Mazen Hashem Shamalakh (22), a paramedic at the Ministry of Health, was hit with a live bullet to the right thigh, and Ibrahim Isamil Abed al-Talalqah (23), a paramedic at the Military Services. • At approximately 21:30, Israeli forces stationed along the border fence with Israel, adjacent to the Return encampment, east of Khuza’ah village, east of Kahn Younis, fired live bullets at a group of young men, who protested in the area, set fire to tires and fired fireworks and laser lights at Israeli sites along the border fence. As a result, 15-year-old child was hit with a live bullet to the left foot and a 25-year-old civilian was hit with a live bullet to the lower limbs. The wounded civilians were taken to Gaza European Hospital. Doctors classified their injuries a s moderate. In similar circumstances, 5 civilians, including a child, were hit with live bullets and their shrapnel to the lower limbs, east of al-Buraij refugee camp in the central Gaza Strip. • At approximately 16:00 on Monday, 24 September 2018, dozens of Palestinian civilians gathered near the coastline between the Gaza Strip and Israel, upon calls from the Supreme National Authority for the Great March of Return and Breaking Siege in al-Sefa area, adjacent to “Zekem” Military base, northwest of Beit Lahia in the northern Gaza Strip. Meanwhile, it should be noted that this is the ninth time for Palestinian boats to sail for Breaking the Siege from Gaza Seaport towards the northern Gaza Strip coastline adjacent to the abovementioned camp. The Israeli gunboats heavily opened fire and fired a number of sound bombs at the Breaking the Siege boats that approached the water barrier established by the Israeli forces and extends to the border fence. The Israeli forces claimed that they established the border fence fearing of naval infiltration. Meanwhile, Israeli soldiers stationed behind sand barriers and cement cubes heavily opened fire and fried a large number of tear gas canisters at Palestinian civilians participating in the demonstration and approached the coastline. As a result, Mohammed Fayez Saleem Abu al-Sadeq (21) from al-Shati’a refugee camp, west of Gaza City, was killed after being hit with a live bullet to the head from the back approximately 18:00 on the same day. He was taken to the Indonesian Hospital in Jabalia. He was transferred to al-Shifa Hospital in Gaza City due to his serious health condition as he suffered from a laceration and bleeding to the head. At approximately 19:45, Mohammed’s death was announced, succumbing to his wounds. Moreover, 46 civilians, including 12 children, a paramedic and a journalist, were wounded. Seventeen of them, including 2 children, were hit with live bullets and their shrapnel and 29 were hit with tear gas canisters. The paramedic was identified a Elin Yahiya Rashad ‘Ashour (21), from al-Daraj neighborhood in Gaza City, was hit with a live bullet shrapnel to the chest, and the journalist Montaser Mustafa Husani al-Sawaf (28), from al-Tuffah neighborhood in Gaza City, who works at the Anadolu Agency, was hit with a tear gas canister to the left foot and the Israeli soldiers fired a live bullet to his camera. • At approximately 19:00 on Tuesday, 25 September 2018, a 16-year-old child was hit with a live bullet to the right thigh while he was near Malakah intersection, east of al-Zaytoun neighborhood, east of Gaza City, during his participation in the M<arch of Return and Breaking Siege. • At approximately 21:30 on the same day, Israeli forces stationed along the border fence with Israel, adjacent to the Return encampment, east of Khuza’ah village, east of Khan Younis, fired live bullets at a group of young men, who protested in the area, set fire to tires and fired fireworks and laser lights at Israeli sites along the border fence. As a result, a 14-year-old child was hit with a live bullet shrapnel to the hand and a 20-year-old civilian was hit with a live bullet to the lower limbs. They were taken to Gaza European hospital and doctors classified their injuries as moderate. • At approximately 22:05, Israeli forces stationed along the border fence, adjacent to the Return encampment, east of Abu Safiyah Hill, northeast of Jabalia in the northern Gaza Strip, opened fire at a group of civilians, who approached the border fence. As a result, an 18-year-old civilian from Beit Lahia was hit with a live bullet to the head, which caused laceration to the skull and an 18-year-old civilian from Beit Hanoun was hit with a live bullet to the chest. The wounded civilians were taken to the Indonesian Hospital in Jabalia and then transferred to al-Shifa hospital due to their serious health conditions. • At approximately 17:00 on Wednesday, 26 September 2018, Israeli forces stationed in military watchtowers established at Beit Hanoun “Erez” crossing, northwest of Beit Hanoun in the northern Gaza Strip, opened fire and heavily fired tear gas canisters at dozens of civilians, who were at the road leading to the vehicles’ gate at the crossing. The civilians set fire to tires and threw stones at Israeli soldiers. That was upon calls from public and national factions to participate in the activity titled: ” Together for the Protection of refugees’ human rights and Breaking the siege”. As a result, 17 civilians, including 8 children, a woman and 2 journalists. Three of them were hit with live bullets and their shrapnel and 14 civilians, including 6 children and a woman, were hit with. Among those wounded was Abdul Rahman Hani Abdul Qader al-Kahlout (21), a photojournalist at Shehab News Agency from al-Tuffah neighborhood in Gaza City, was hit with a tear gas canister to the right arm, and Mohammed Ismail Khalil Jarbou’a (44), a photojournalist at the Information Office of the Popular Front for the Liberation of Palestine from al-Buraij refugee camp in the central Gaza Strip, was hit with a tear gas canister to the face. The wounded civilians were transferred via ambulances belonging to PRCS and the Palestinian Ministry of Health to the Indonesian hospital and al-Awda Hospital. Doctors classified their injuries between minor and moderate. Moreover, dozens of civilians suffered tear gas inhalation and received medical treatment on the spot. • At approximately 21:00, Israeli forces stationed along the border fence with Israel, adjacent to the Return encampment, east of Khuza’ah village, east of Khan Younis, fired live bullets at a group of civilians, who protested at the area for 2 hours. The young men set fire to tires and fired fireworks along the border fence. As a result, a 20-yar-old civilian was hit with a live bullet to the left leg. The wounded civilians were taken to Gaza European Hospital and doctors classified their injuries as moderate. • At approximately 22:00, Israeli forces stationed along the border fence with Israel, adjacent to the Return encampment, east of al-Shawkah village, east of Rafah in the southern Gaza Strip, fired live bullets at a group of Palestinian young men, who protested at the area. As a result, a 20-year-old civilian was hit with shrapnel to the head and a 25-year-old civilian was hit with a live bullet to the left leg. • Following the Friday Prayer on 21 September 2018, dozens of Palestinian civilians and international human rights defenders gathered on agricultural lands of al-Resan Mount area, west of Ras Karkar village, west of Ramallah in protest against the Israeli settlers’ attempt to seize the land. When the protestors approached the area, Israeli soldiers fired live and rubber bullets, sound bombs and tear gas canisters at the protestors. As a result, a 23-year-old civilian was hit with a rubber bullet to the foot. • Around the same time, dozens of Palestinian civilians and Israeli international human rights defenders organized a similar demonstration in Bil’in village, west of Ramallah. The Israeli forces used force to disperse them firing live and rubber bullets, sound bombs and tear gas canisters at them. Meanwhile, a number of soldiers burnt 10 olive trees near the annexation wall. • At approximately 13:40 on the same Friday a group of Palestinian civilians moved from Kufor Qaddoum village, northeast of Qalqiliyah, to the eastern entrance to the village, which has been closed for 15 years. The protestors chanted national slogans demanding end of occupation and condemning the Israeli forces’ crimes against Palestinian protestors along the eastern border of the Gaza Strip within “The Great March of Return and Breaking the Siege” activities. The protestors threw stones at Israeli soldiers stationed behind sand barriers. The Israeli soldiers fired rubber bullets, sound bombs and tear gas canisters at them. As a result, a 40-year-old civilian was hit with a rubber bullet to the right leg and a 22-year-old civilian was hit with a rubber bullet to the right leg too. Moreover, a number of the protestors suffered tear gas inhalation. Ramallah and al-Beirh: Israeli forces established (9) all over the City. On Thursday, 20 September 2018, Israeli forces established 3 checkpoints at the entrances to Silwad and ‘Ain Yabroud villages, northeast of Ramallah; and at the intersection leads to ‘Aboud and al-Nabi Saleh villages, northwest of the city. On Tuesday morning and evening, 25 September 2018, Israeli forces established 6 checkpoints at the main entrance to al-Nabi Saleh village, at the main entrance to Senjil village, at the entrance to Western Mazra’ah village, at the main entrance to Ras Karkar village, at the entrance to Silwad village, and at the main entrance to ‘Ain Yabroud village. , northwest of Rmallah; and at the entrance to ‘Our Tahta village, west of the city. On Saturday, 22 September 2018, Israeli forces established 5 checkpoints at the entrance to Sa’ir village; at the entrance to Wad al-Jouz entrance, east of Bani Na’iem village; at the entrance to al-Fawar refugee camp; at the entrance to al-Jalajel village; and on Wad al-Hussain Road, east of Hebron. On Sunday, 23 September 2018, Israeli forces established 2 checkpoints at the southern entrance to Hebron and at the entrance to Sa’ir village. On Monday, 24 September 2018, Israeli forces established 5 checkpoints at the entrance to al-Dahiriyia village, at the entrance to Taramah village, on ‘Oyoun Abu Saif Road, at the southern entrance to Halhoul village, and at the northern entrance to Hebron. On Tuesday, 25 September 2018, Israeli forces established 4 checkpoints at the entrance to Sa’ir village, at the southern entrance to Hebron, at the entrance to Bani Na’iem village, and at the entrance to Samou’a village. On Wednesday, Israeli forces established 3 checkpoints at the southern entrance to Hebron, at the entrance to Sa’ir village and on Beit ‘Aynoun village’s road. At approximately 14:30 on Saturday, 22 September 2018, Israeli forces established a checkpoint at the entrance to ‘Izbit al-Tabeeb village, east of Qalqiliyia, and no arrests were reported. At approximately 22:45 on Sunday, 23 September 2018, Israeli forces established a checkpoint at the intersection of Jeet village, northeast of Qalqiliyia, and no arrests were reported. On Saturday morning and evening, 22 September 2018, Israeli forces established 2 checkpoints at the entrance to Kaful Hares village, north of Salfit, and no arrests were reported. On Sunday, 23 September 2018, Israeli forces established a checkpoint at the entrance to Kaful Hares village, north of Salfit, and no arrests were reported. On Monday, 25 September 2018, Israeli forces established a checkpoint at the entrance to Merda village, north of Salfit, and no arrests were reported. Tulkarm: Israeli forces established (2) checkpoints all over the city. At approximately 16:40 on Friday, 21 September 2018, Israeli forces established a checkpoint between Safareen and Beit Lid villages, east of Tulkarm. On Monday, 24 September 2018, Israeli forces established a checkpoint at the entrance to Far’oun village, south of Tulkarm. No arrests were reported. At approximately 21:55 on Friday, 21 September 2018, Israeli forces established a checkpoint at the southern entrance to Kaful Hares village, north of Salfit. They searched Palestinian civilians’ vehicles and checked their IDs. The Israeli forces withdrew later and no arrests among civilians were reported. • At approximately 14:30 on Sunday, 23 September 2018, Israeli forces stationed at a military checkpoint in the vicinity of “Alon Moreh“ settlement established on Salem and Dir Hatab villages’ lands, northeast of Nablus, arrested Suliman Mahmoud Suliman Ka’bi (18), from ‘Askar Camp, northeast of Nablus. Suliman was arrested under the pretext of his presence near the settlement. His family was informed that his son was arrested by the Israeli forces. • On Thursday, 24 September 2018, Israeli forces moved into occupied East Jerusalem’s Old City. They raided and searched houses, from which they arrested 4 civilians, including a child. The arrested persons were identified as Rohi Mahmoud Kalghasi (22), Murad Mousa al-Ashhab (26), Mo’min Na’iem al-Hasheem (18), and Ya’qoub Yousef al-Dabbagh (17). Few hours later, the Israeli forces released them on one condition that they will deport from al-Aqsa Mosque for 6 months. • On Thursday evening, the Israeli Intelligence Service called via cell phone around 14 Palestinian young men; most of them were from occupied East Jerusalem’s Old City, informing them to refer to the Intelligence office on Sunday, 23 September 2018. Those summonses coincided with the Israeli settlers’ calls for storming al-Aqsa Mosque next Monday under the pretext of Jewish holidays. • At approximately 01:00 on Sunday, 23 September 2018, Israeli forces moved into al-‘Issawiyia village, northeast of occupied East Jerusalem. They raided and searched a house belonging to Yaser Mohamed Darwish (33), Secretary of Fatah Movement in the village, and then arrested him. • On Sunday morning, Israeli police handed deportation notices for 3 employees at Islamic Endowment Department (Awqaf) in occupied East Jerusalem’s Old City, stating that they will be denied entry into al-Aqsa Mosque for one week. Feras al-Debes, Head of Media and Public Relation Department in the Islamic Endowments (Awqaf), said that the Israeli police decided to deny Mahdi Ameen al-‘Abasi (42), al-Aqsa Mosque’s Guard, along with Raied Zaghir (41) and Husam Seder (29), Employees in the Reconstruction Committee of Endowments Department in al-Aqsa Mosque, entry into the mosque for one week. Al-Debes added that the Israeli police handed the 3 employees summonses to attend for interrogation the next week to consider their access denial and its duration. Al-Debes pointed out that the employees of the Islamic Endowment Department were informed of the entry banning decisions by an Israeli officer at al-Qashlah Police Station in West Jerusalem. It should be noted that the Israeli police banned the entry of more than 20 Palestinians, including the employees of the Islamic Endowments Department, activists and other persons continuously coming to the mosque, into the al-Aqsa Mosque within varying periods. The ban decisions issued by the Israeli police came out coinciding with the Jewish holidays, claiming that those Palestinians obstructed their work, in addition to obstructing the Jews’ visits to the mosque. • At approximately 01:00 on Tuesday, 25 September 2018, Israeli forces moved into al-Tour neighborhood, east of occupied East Jerusalem. They raided and searched a house belonging to Mohamed ‘Ali Abu Ghannam (16) and then arrested him. • At approximately 03:00 on the same day, Israeli forces moved into Silwan village, south of occupied East Jerusalem’s Old City. They raided and searched houses, from which they arrested 3 civilians, including a child. All the arrested persons were taken to al-Maskobiyia Police Station for investigation. The persons arrested were identified as ‘Adnan Eyad al-Rajbi (16), Mahdi Mohamed Jaber (20), and ‘Alaa ‘Abdullah ‘Awwad (32). • At approximately 10:00, Israeli police arrested 2 employees working in the Reconstruction Committee of Endowments Department in al-Aqsa Mosque while on duty in the al-Aqsa Mosque yards in occupied East Jerusalem’s Old City. All of the arrested employees were then taken to a detention facility for interrogation. The arrested employees were identified as Anas al-Dabbagh (27) and ‘Ali Bakirat (29). • At approximately 18:00, Israeli police arrested a Palestinian civilian along with his son after beating them on al-‘Ein Street in Silwan village, south of occupied East Jerusalem’s Old City. This assault happened coinciding with the closure of Silwan village’s streets and neighborhoods to secure the Israeli settlers’ entry while celebrating their holidays. Eyewitnesses said that the Israeli police closed a number of roads in Jerusalem and other surrounding villages due to Jewish holidays. They also tightened their measures in Silwan village, during which, verbal altercation erupted between the village’s residents and Israeli police officers while securing a demonstration for the Israeli settlers on the village’s streets. The verbal altercation turned into beating by the Israeli officers. They then arrested Waleed Mousa al-Rajbi (46) and his son Fathi (21) while they were in front of their shop in the village. On the same day afternoon, the Israeli police closed all streets and roads leading to Silwan village to facilitate the settlers’ celebrations and demonstrations in Silwan village, Bab al-Magharebah area and al – Buraq Wall, which caused traffic jams in the village’s neighborhoods. Moreover, the village’s residents were forced to pass through bypass roads for entering and exiting the village. • At approximately 01:00 on Wednesday, 26 September 2018, Israeli forces moved into Abu Dis village, east of occupied East Jerusalem. They raided and searched a house belonging to Mohamed Naser Mohsen (22) and then arrested him. • At approximately 08:00 on Thursday, 20 September 2018, the Israeli authorities handed Majdi al-Showaki a notice to stop construction work in his house. The Israeli authorities then took photos of 2 other houses and a retaining wall in ‘Ain al-Jouwaizah neighborhood in al-Waljah village, northwest of Bethlehem. Khadir al-A’raj, Deputy Head of al-Waljah village council, said that an Israeli military force accompanied with the Jerusalem Municipality staff moved into ‘Ain Jouwaizah neighborhood and notified Majdi to stop construction works in his house. They also took photos of 2 inhabited houses belonging to Naser Shehada and ‘Emad al-A’raj, in addition to taking photos of a retaining wall surrounding houses of Abu Rezeq Family. Al-A’raj said that the notices included summonses for the houses ‘owners forcing them to self-demolish their houses or they will pay the demolition costs. He clarified that they will not obey the Israeli orders and will confront them in many ways, including resorting the Israeli judiciary and organizing protests. He pointed out that the neighborhood adjacent to an uninhabited al-Malhah village is the targeted neighborhood in order to fully annex it within Jerusalem Municipal borders. The Jerusalem Municipality has been working on annexing the above-mentioned neighborhood for 30 years. The Israeli forces previously demolished al-Noor Mosque in the abovementioned neighborhood 20 years ago and damaged the street that connects the neighborhood with the rest of the village. Moreover, the Israeli forces demolished more than 30 houses and there are around 40 cases in the Israeli Courts due to demolition notices. • At approximately 10:00 on Thursday, Fady al-Shawammrah self-demolished his house in al-Ashqariyia neighborhood in Beit Haninah village, north of occupied East Jerusalem, applying the Israeli Municipality decision. Fady said that the Israeli forces demolished the house in 2004 and rebuilt it in 2006 in al-Ashqariyah neighborhoud, pointing out that he built and annexed an additional structure to the house. The Israeli forces started again harassing him to stop the construction works under the pretext of non-licensing. Fady said that the 180-square-meter house was sheltering 14 members, including 6 children. He emphasized that the plot of land belongs to him while the Israeli forces claimed that part of his house was not built on his land. Fady said that he received many demotion notices from the Israeli Municipality staff and stated that: “the Israeli authorities recently attempted to demolish the house, but something happened and obstructed the entry of the municipality staff to the house.” He added that on Tuesday, 18 September 2018, the Israeli Municipality staff raided his house and told his wife that the house should be completely demolished; they meant the old and new house. As a result, Fady next day morning self-demolished his house along with his family members, confirming that he does not have any shelter for him and his family, but this house. • On Sunday, 23 September 2018, the Israeli authorities notified the residents of Khan al-Ahmar Bedioum Community, east of occupied East Jerusalem, to evacuate their houses and self-demolished them during one week. Eyewitnesses said that the Israeli Civil Administration staff accompanied with Israeli military forces moved into Khan al-Ahmar Bedioum Community to hand its residents notices to self-demolish their houses at the beginning of October. 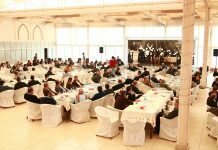 The Wall and Settlement Resistance Commission called for demonstrations in solidarity with Khan al-Ahmar Community and demanded Palestinians to confront anyone attempts to demolish the community. The Wall and Settlement Resistance Commission said in its statements that the Israeli forces action of handing demolition notices for the residents of Khan al-Ahmar Community further prove the Israeli ongoing policy of forcible displacement against Palestinians in the Community. The Wall and Settlement Resistance Commission also stated that: “This step that includes demolishing Khan al-Ahma School, which provides education not only for Khan al-Ahmar Community, but also for all surrounding Bedouin communities, and sheltering the students’ families, constitutes a violation of human rights and international humanitarian law.”. The Wall and Settlement Resistance Commission clarified that the Israeli forces insist on declaring a war against the Palestinian cause through implementing the ethnic cleansing scheme against Palestinians in the eastern slopes of Jordan Valley. It should be noted that the Israeli police usually use excessive force while demolishing and evicting the Palestinian houses. The Israeli Supreme Courts issued a decision to demolish Khan al-Ahmar Community, which shelters around 80 Palestinian families (190 members) from al-Jahalin tribe.